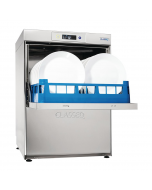 The standard range of Classeq front-loading commercial dishwashers (commonly referred to as a commercial cabinet or under-counter dishwashers) are simple to use, easy to clean and effortless, consistent dishwashing results on all types of crockery, plates and dishes. They are well suited to a range of commercial applications from nurseries, coffee shops to high volume commercial kitchens. Simple intuitive two button control combined with colour coded wash cycle management display ensures an improved operator experience whilst a fixed three-minute cycle allows for maximum output without compromising wash quality. Temperature interlock guarantees rinse at the correct temperature and a WRAS Compliant Type ‘B’ Gap ensures water board compliance (for low risk areas). Supplied with waste and water hoses for UK fitting. An optional water softener should be installed in hard water areas to prevent lime scale build up that could be harmful to wash results and machine longevity.